Published in Panorma, December 2010. Even though wine probably came to Uruguay along with the Spaniards, this southern country’s wine industry began with the 19th century arrival of Tannat stock, which left its mark. Originally from the Madiran region of southwestern France, the stock was carried to the austral region of South America by a Basque, Pascual Harriague; Uruguay used it to produce table wines for internal consumption for more than a century. However, in the 1980s, some companies restructured grape-growing and production to achieve high-quality wines that were increasingly successful on the demanding international markets. These wines are now available in more than thirty countries and can boast a never-ending list of awards earned at international festivals. According to data from the National Viticulture Institute - an association of wine producers linked to the government - wine exports rose from 1.2 to 13.5 million liters between 2004 and 2008. The prestige of fine Uruguayan wines continues to grow and it can hold its own with no less than Chile and Argentina, the region’s traditional exporters. Just as Chile has its Carménère and Argentina its Malbec, the star variety in this development – albeit not the only one - is the Tannat. Just like the wine growing regions of those countries, Uruguay is located between the 32nd and 35th parallels. The subtropical climate softened by sea breezes and the large variety of soils allows specialization for different types of wines. The “terroir” – the combination of climate and soil - is obviously ideal for viticulture. It is often compared to the Bordeaux region. Uruguay is the first country to develop fine wines that are 100% Tannat. This stock results in a strong, aromatic red wine: full-bodied and slightly rough and fruity with marked tannins, not to mention excellent antioxidant properties. Wine experts say that the palate needs to become accustomed to Tannat - savor it slowly and combine it with red meat and aged cheeses. Even though Tannat is undoubtedly the emblematic Uruguayan wine, there are other export varieties such as Cabernet Sauvignon, Cabernet Franc, Merlot, Pinot Noir and Syrah; and among white wines, Chardonnay, Riesling and Sauvignon Blanc. The Bouza winery, twenty minutes from downtown Montevideo in the midst of lovely farms, offers guided tours with tastings and optional lunch three times a day. As with the rest of the thirteen wineries making up this association, advance reservations are necessary. The photographer and I arrive a few minutes after eleven in the morning on a splendid spring day and join the guided tour. The winery dates from 1942 and looks like a church complete with bell tower and an image set in the façade by the first owners, the Pesquera family, to thank St. Isidro Labrador for the fertile soil. The tour begins in the park, which has all the charm of the countryside; it continues in the production plant, passes through the wine cellar and the classic car museum (one of the owner’s passions) and ends in the restaurant with an exquisitely presented tasting, in which the wines are combined with a spread of cold meats, cheeses, dried fruits and freshly-baked breads. We try a white Albariño and three reds: a Merlot, a mix of Merlot and Tannat, and lastly a Tannat from plot A6. This plot is a good example of the restructuring of plantings. Here, the base of the vine is covered with red stones that reflect sunlight to provide the grapes with more light and heat. The lower wire is also located closer to the ground than usual. Florencia - our guide - explains that both here and in other parts of the vineyard, only one bunch per cluster is left on the plant, sacrificing quantity in the name of quality; the bunches draw more from the plant and the grapes have concentrated properties. 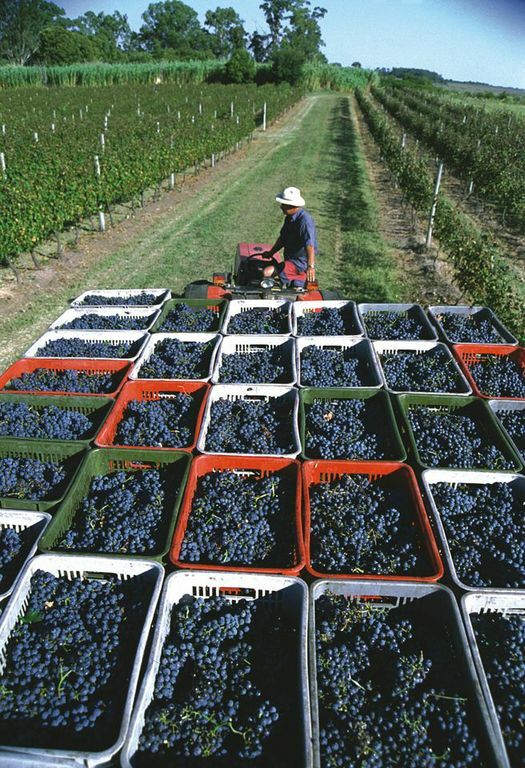 Harvesting and the subsequent selection of grapes are done entirely by hand, and the selected grapes are gently crushed so as to not damage the seeds. The resulting juice is fermented at controlled temperatures in barrels of French oak (for the most outstanding wines, they use grapes from just one plot), stainless steel tanks or cisterns for fifteen to eighteen days, and constantly monitored by the technical team headed by oenologist Eduardo Boido. Then it goes to the cellar, where it is aged in oak barrels for six to eighteen months and then in bottles until the oenologist determines that it is ready for consumption. Production is estimated to be three hundred 750-milliliter bottles per barrel. The rest of the product is used to make what the Bouza winery calls orujo (marc), better known as grappa, a clear 80-proof beverage. The oak barrels are used for three harvests and then sold to other wineries for making table wine, since the oak loses its properties over time. The next stop is Varela Zarranz, a large winery with more than 247 acres of vineyards; fine wines make up barely 5% of total production and are currently sold mainly on the domestic market. The winery exports to Canada and has plans to seek new markets. The wines have already earned a number of awards at international festivals. The winery is located some 19 miles northeast of Montevideo, in the Canelones countryside. We are welcomed by Magdalena Américo, sommelier for Varela Zarranz and president of the Wine Tourism Association; she serves as our host for a private guided tour. At the end of the 19th century, the first vineyards, the winery and the villa belonged to Diego Pons, a well-known politician from Montevideo high society. Pons founded the winery in 1888, importing the stocks from France and the machinery from Italy. Today it is the property of the third generation of Varela family winegrowers; they began restructuring production in the 1980s. The house and the park exude the charming air of the farms of that era, as does the access road flanked by hundred-year-old olive trees. It is delightful to walk through gardens full of sculptures and antique vases, all surrounded by endless vineyards. Located in the old basement of the house, the tasting room still has its original stonewalls and is decorated with unquestionable good taste. The cool dark passageways of the wine cellar hold nearly one hundred barrels of French oak, - each holding 10,000 liters - imported by the former owner more than a century ago. They are preserved as part of the winery’s heritage, since more than a century of use has deprived them of the ability of impart oak bouquet or taste to the wine. Alongside the impressive barrels rest fine wines in casks of French or North American oak. Magdalena tells us that the thirteen wineries comprising the Wine Roads are open to anyone wishing to visit - with advance reservations - and they have developed four annual festivals to promote tourism: grape harvest (March), Tannat and lamb (June), pruning (August) and young wines (November). All the wineries are also open to the public on heritage weekend (September-October). Of the thirteen wineries that form part of the Wine Roads, three are located in semi-rural areas of Montevideo, one in the Province of Rivera, two in Maldonado (near Punta del Este) and the rest in Canelones, a province surrounding that of Montevideo. All the wineries in this small country are open to visitors, and several wineries may be included in one tour, or visits may be combined with other unrelated tours. As you would expect, visitors can plan their routes according to their interests, helped here by the Wine Tourism Association website. Publicadas por Unknown a la/s 1:14 a. m.